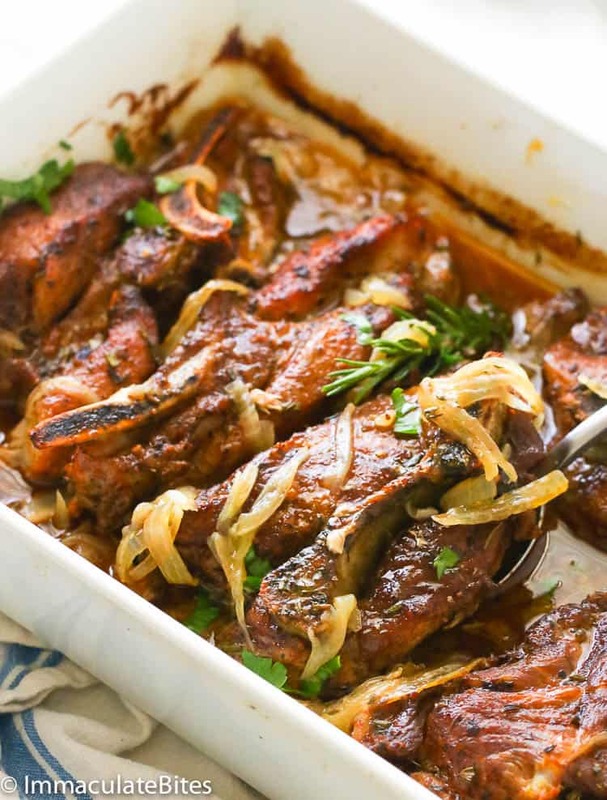 Country Style Ribs – fall-apart tender country style ribs slowly cooked in the oven oozing with flavors and aroma using only 6 simple ingredients. Rich, tender, economical and so easy to make! This is a big revelation, but I am more on the TEAM BEEF side ’cause hello medium-rare steaks and stir-fry! Honestly, I prefer the taste of the beef, when done right, as compared to pork. I’ve cooked beef in all sorts; from this Ground Beef Casserole to this Prime Rib Roast here and even this Spicy Garlic and Rosemary Grill Steak. All of them have a special place in my heart! So when I went out with hubby for a fancy dining at a nearest resto here in LA, I was blown away with how delicious there country style ribs are. It was lip-smacking good that eating it by the hands would be the perfect way to satisfy your soul. And it was a whole lot more affordable than a New York Steak or a Baby Back Ribs! 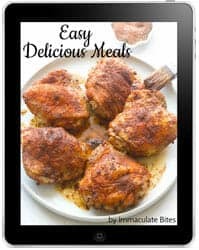 What are country style pork ribs? Country style pork ribs are actually aren’t ribs at all! Whaaaat?? They are actually pork chops from the shoulder end of a pig’s loin which is the same meat used when cooking carnitas. What I even begun to love about these country style ribs is that they are super cheap and meatier compared to regular pork. They also have that beautiful marbling of fat which helps them moist during the slow cooking process rendering fall-part tender meat and juicy! 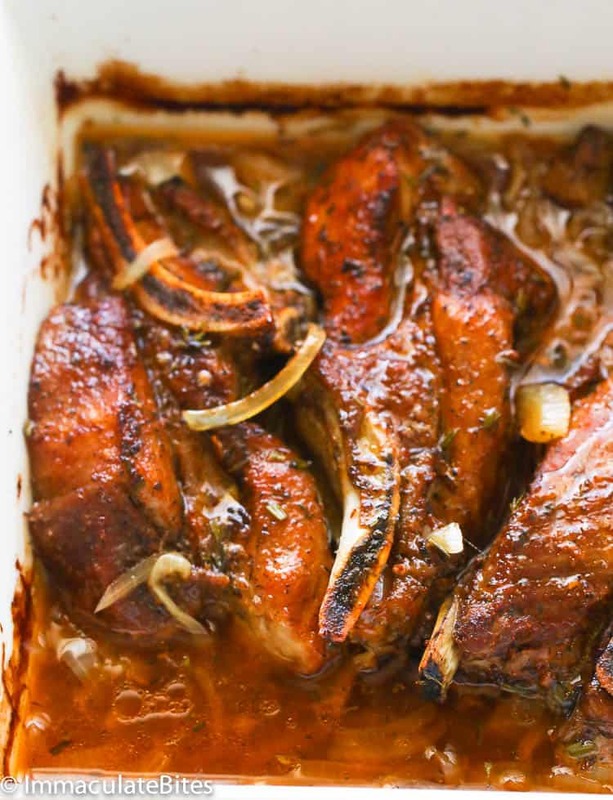 How long to cook country style ribs in the oven? I know you probably want to skip the reading part of this post after you see all those photos, and I can’t blame you for that. 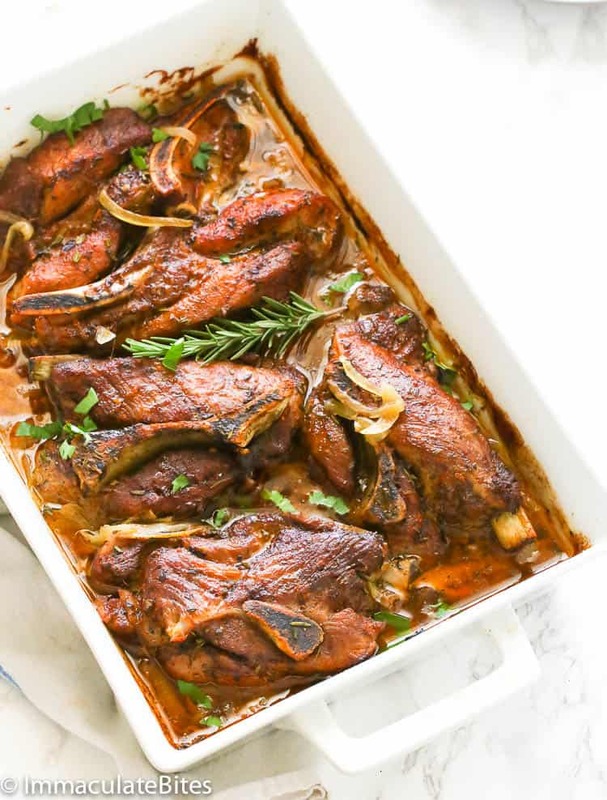 This Oven Baked Country Style Ribs recipe is one of the EASIEST recipe that you should add in your recipe box. And that sauce?? It is to-die-for! You’d gladly smother it on warm rice, mashed potatoes and even veggies. The best way to achieve that tender meat with all the juices is to cook it in the oven in a baking pan covered with foil paper for about an hour. Slow cooking process allows to melt of those fatty marbling and keeping the meat moist all throughout the process. After an hour, you have to uncover the meat and continue cooking for another 30 minutes to reduce the liquid and to brown nicely. Words can’t explain how fantastic this recipe is with all those savory, garlicky aromatic flavors lingering in your taste buds. 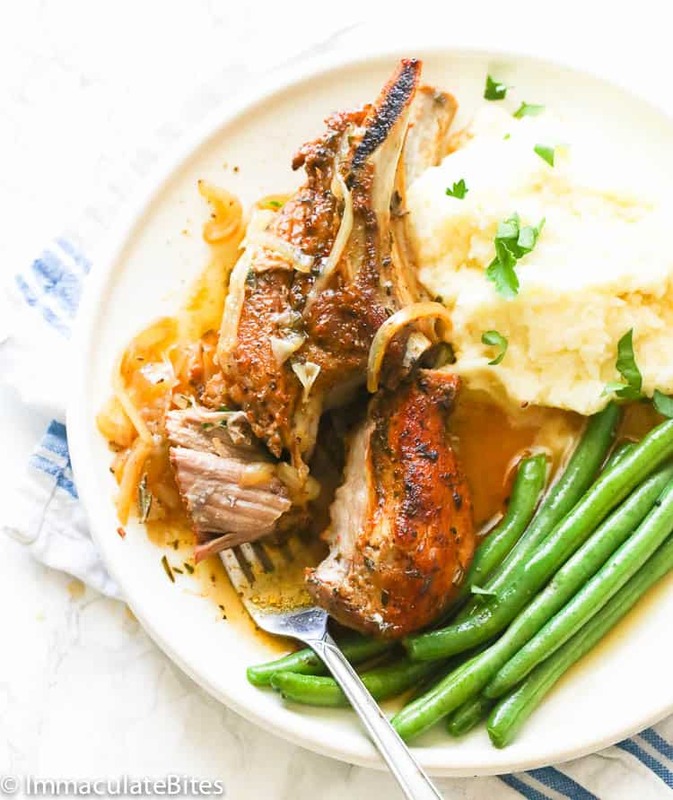 Pair this extra delicious country style ribs with my green beans and bacon and this roast garlic mashed potatoes. You can serve this on a weekly rotation or on special gatherings. Just imagine how far your 6 ingredients could go using this fuss-free recipe. If making for guests, I recommend having a generous serving of two ribs per person. No Creole seasoning at home? You may sub it with smoked paprika. 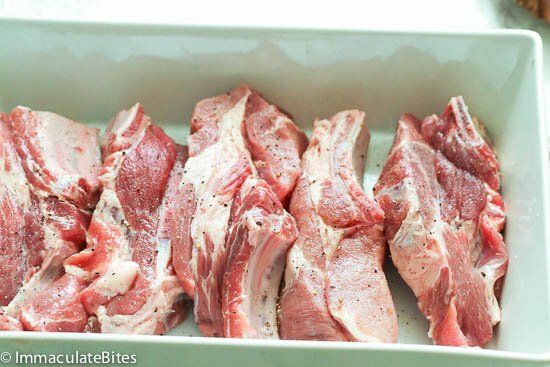 When looking for a packaged country style ribs, go for the ones with similar sizes for even cooking. 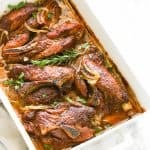 Country Style Ribs - fall-apart tender country style ribs slowly cooked in the oven oozing with flavors and aroma using only 6 simple ingredients. Rich, tender, economical and so easy to make! 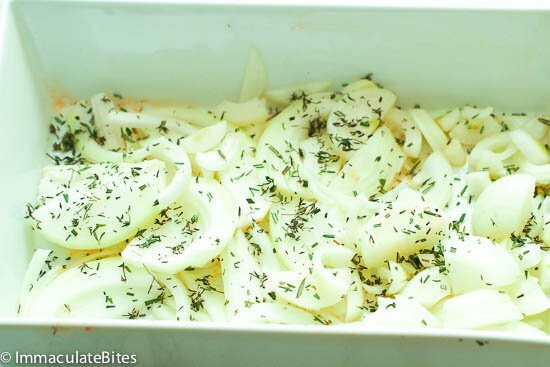 Prepare shallow baking pan or roaster, by placing onions , half of the thyme and rosemary in the pan. Set aside. 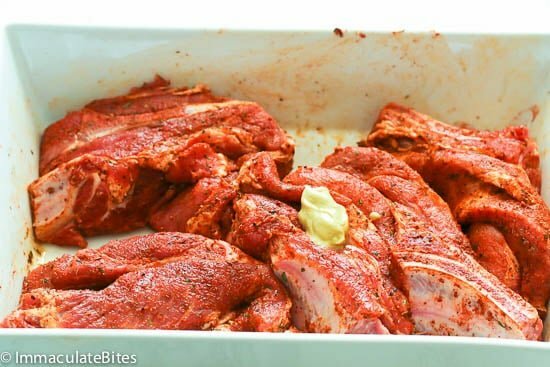 Place ribs in a single layer in prepared roasting pan. Add more , if desired. Carefully cover baking pan with foil paper and bake for about an hour . After an hour uncover and continue cooking for about 30 minutes . This lets the liquid reduce and the pork to brown nicely. Serve the ribs with mashed potatoes , with sauce from the ribs. Preheat your oven to 350 degrees F. Prepare shallow baking pan or roaster by placing onions and thyme in the pan. Set aside. Then season with Creole seasoning, thyme and rub with Dijon mustard. 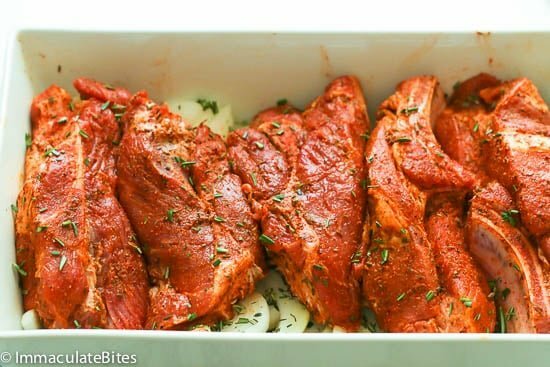 Place ribs in a single layer in prepared roasting pan. Add garlic and more thyme , if desired. Carefully cover baking pan with foil paper and bake for about an hour . After an hour uncover and continue cooking for about 30 minutes . This lets the liquid reduce and the pork to brown nicely. Serve the ribs with mashed potatoes with the sauce from the ribs. Making these right now! Will follow up. Even though I messed up on some of the seasoning it came out very tasty and tender. A great recipe. Thank you for dropping by, Marty. I’m glad it still turned out great for you. Thanks so much for the recipe! My home smells amazing:)I can’t wait til they’re done. Enjoy, Shelley! Thanks for trying it out. We just made these! They were so yummy!! Although mine didn’t look nearly as pretty haha! And I literally have zero sauce. Just like a little oil/fat juice. Any idea what to do differently? Hi Cassie , it’s best to use a deep dish when making these ribs. I made these a couple weeks ago and was a great hit with my family. Will definitely be doing this again. Would boneless work also? It’s what I have. I’ve been making this one, too! 🙂 Glad it turned out great for you as well. Thank you for dropping by! Hello, this looks really good. Wanted to know if there is a cut of beef that can be substituted for the pork ribs? Or does the recipe work only with pork? Hello Dennette, chuck Short ribs or short ribs would work. Can this be made with beer ribs? Made country style ribs yesterday. They were very good. I like the addition of Dijon mustard. Will not use creole seasoning again too spicy for us. Can I use dried thyme and dried rosemary instead? If so, how much? Thank you for the message, Adeola.=) Happy weekend! Making it right now with garlic mashed sweet potatoes and green beans! So excited!